Researchers from EPFL and the University of Zurich have developed a model that uses data from sensors worn by meerkats to gain a more detailed picture of how animals behave in the wild. Their study was published in Methods in Ecology and Evolution. Advancement in sensor technologies has meant that field biologists are now collecting a growing mass of ever more precise data on animal behaviour. Yet there is currently no standardized method for determining exactly how to interpret these signals. Take meerkats, for instance. A signal that the animal is active could mean that it is moving; alternatively, it could indicate that it is digging in search of its favorite prey, scorpions. 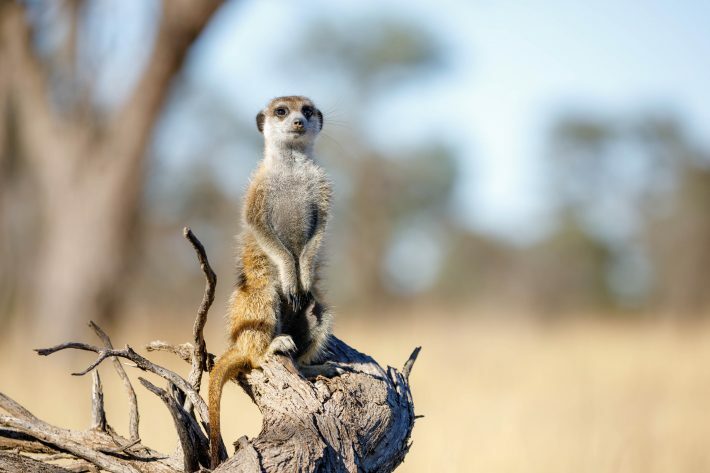 Likewise, an immobile meerkat could be resting – or keeping watch. In an effort to answer these questions, researchers from EPFL’s School of Engineering Laboratory of Movement Analysis and Measurement (LMAM) teamed up with colleagues from the University of Zurich’s Population Ecology Research Group to develop a behavior recognition model. The research was conducted in affiliation with the Kalahari Research Centre. The new model draws on general biomechanical principles such as posture, movement intensity and frequency. It allows researchers to precisely determine what an animal is doing – resting, keeping watch, running, or searching for food – using input from a wearable accelerometer. The device, which is compatible with a variety of species, has been repurposed by the LMAM research team to capture data such as body inclination, acceleration, vibrations and impacts. First, the model distinguishes between two broad categories of behavior – dynamic (running, searching for food) and static (resting, keeping watch) – by analysing movement and posture intensity. If the animal is still, the researchers can tell whether it is resting or keeping watch by looking at the inclination of its torso. And when the animal is on the move, they can use movement intensity and frequency to determine whether it is running or searching for food. The fieldwork was carried out by specially trained long-term volunteers at the Kalahari Research Centre. The team fitted sensor collars to 10 meerkats, then recorded data and filmed the animals going about their business for three hours. After analysing the recordings to identify different types of activity, the researchers developed a hybrid model, using biomechanical principles and the data collected in the field to train a machine-learning algorithm to recognise different patterns of behavior. The Kalahari Research Centre was set up in 1993 by the University of Cambridge and is the site of several research projects.